Kumo no you ni, Kaze no you ni ("Kumokaze" for short) is very often mistaken for a Miyazaki or Studio Ghibli film due to the similarities between the styles of Katsuya Kondou, the character designer and animation director for Kumokaze, and the style of Miyazaki's works. Some people have commented that the main character, Ginga, looks like an Asian Kiki. Kumokaze, however, was produced by Studio Pierrot, the animation studio famous for such series as Kimagure Orange Road. 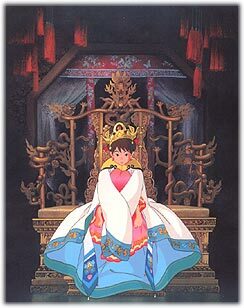 The story is set in ancient China, and follows the adventures of Ginga as she goes from being a simple country girl to being a concubine of the Emperor. The movie is based on the novel Koukyuu Shousetsu by Ken'ichi SAKEMI.